The OME-DB-24C has 24 channels of optically isolated digital outputs, arranged into four isolated banks. Each digital output offers a darlington transistor and integral suppression diode for inductive load. 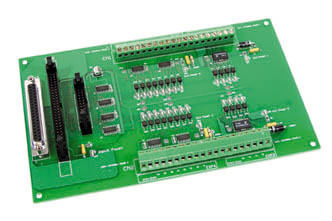 The board interfaces to field logic signals, eliminating ground-loop problems and isolating the host computer from damaging voltages. The OME-DB-24C has one 37-pin D-sub connector, one 50-pin male and one 20-pin male connector. The transistor is energized by applying a 5 V signal to the appropriate input channel on the 50-pin connector, 20-pin flat cable connector or 37-pin D-sub connector. Twenty-four enunciator LED’s, one for each transistor is activated.